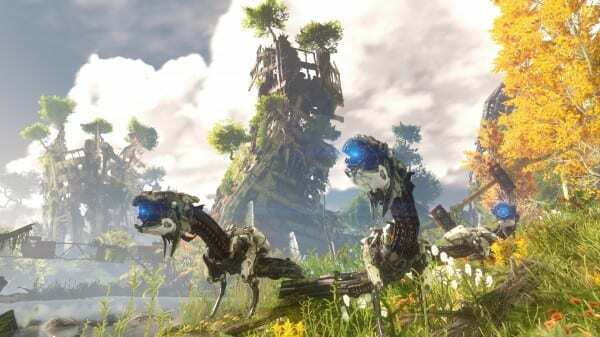 Horizon Zero Dawn has a lot going on within its open world, and a lot of it has to do with the characters that inhabit it. These are the move makers of the world, and you’ll interact with them quite often as you journey through different areas and speak with the different tribes that humanity has been reduced to. They each have their own motives, but those individual desires all feed into the greater plot. Aloy – Horizon Zero Dawn’s main Protagonist and the person you’ll control while playing. Originally an outcast of the Nora tribe for unknown reasons, she finds herself in the middle of a war after proving herself to her people and then witnessing a massacre. Rost – Another Nora outcast, Rost is the father figure in Aloy’s life and the man who trains her to be the hunter that she is today. Teersa – One of the Higher Matriarchs of the Nora Tribe, and one of the few who shows Aloy kindness. She believes Aloy has some destiny and sends her on her mission. Avad – Avad is the Sun King of the Carja after killing his father who used to massacre the other tribes. He fights for peace and unity after his father’s mad reign. He can be found in Meridian and will be an ally for you going forward. Erend – An Oseram warrior, he serves as one of the envoys of the Carja kingdom and is present on the day of Aloy’s proving. He’s a supporter of the uniting of the different tribes. Olin – Olin is a member of the Oseram tribe as well and a friend of Erend’s. He proves to be quite mysterious after Aloy notices he has a device that she thought only she had. Helis – Helis was the top gladiator in Meridian until the mad king, Avad’s father, was overthrown. He is now the leader of the Shadow Carja and one of Horizon Zero Dawn’s primary antagonists. Sylens – A mysterious man who appears to help you, though he seems to have other motives as well. HADES and GAIA – These two are clearly named after gods so they are definitely key players in the story. Horizon Zero Dawn takes place on Earth, though hundreds of years have passed and it’s no longer recognizable as the world we live in today. Nature has reclaimed the land, with plants growing over once mountainous cities, and humanity being pushed into caves, mountains, and other far reaches of the land. On the ground where you can find foxes, turkeys, and other wildlife are robots that appear to be mechanical animals. They look like deer, rams, dinosaurs, and more as they roam around living out their lives as real animals would. They hunt, they graze, and they watch, but nobody knows why, which is the main mystery of Horizon Zero Dawn. In the world are several tribes that live as we ourselves did way back when. Some hunt, some focus on religion, others build a new, sprawling civilization. Everyone knows of the old ones, the humans that were there before the collapse, but it’s not clear what caused everything to go so wrong. Nora – This is the tribe that Aloy is a part of. They are like a typical native tribe, relying on animals around them for clothing and sustenance and respecting nature. They are trained to hunt the robots for defensive needs and resources, but mostly keep to themselves. They kill any trespassers in their land. Banuk – These are the people who worship the machines. They are a peaceful people who seek to understand the robots through observation and worship. They will of course fight if they have to, but they tend to be accepting of others. Oseram – Warriors and metal workers. They are now allies with the Carja and Erend is the Oseram you’ll find yourself speaking to the most. They are a tough people, and would be the strongest if it weren’t for the Carja. Carja – The “sun people.” Of all the tribes in Horizon Zero Dawn, this is the most advanced. They have built cities and palaces, are run off of a monarchy ordained by god (the sun), and at one point were very vicious. The new king, Avad, killed his father who had been oppressing and murdering the other tribes. He now seeks peace and unity, something that has caused the development of a new tribe and one of the bigger antagonists you’ll have to face against. Shadow Carja – A tribe that was born from the collapse of the mad reign of Avad’s father. Led by Helis, who was a champion gladiator who would kill slaves for sport, they worship the eclipse rather than the sun and endeavor to bring darkness to Meridian and the Sun King. It is the Shadow Carja who are raising the machines and turning them violent, though how they’re doing that is a bit complicated. When Horizon Zero Dawn begins, you find yourself in control of a young girl named Aloy who, if you didn’t know by now, is the main protagonist of the story. She’s an outcast, though it’s not stated why at this point. All you know is that the Higher Matriarchs of the Nora tribe have given her over to Rost, another outcast, to care for her. 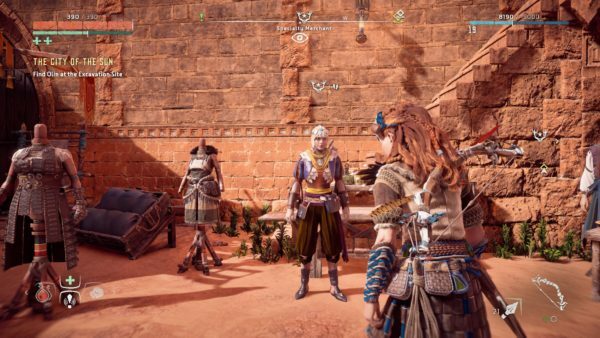 As Aloy grows older you can see and feel the resentment she receives from members of the Nora tribe as they look on her with disgust and speak of her in harsh whispers. This is quite confusing when first starting out, but it is explained a few hours later. It turns out that she is shunned because she is “motherless.” Mothers are very important in their culture, so to be a child without one is something unnatural and taboo. And it’s not that her mother died or something like that, nobody has ever seen her. Aloy was found crying and alone by the Higher Matriarchs in a room that only they have access to. It was then that many of the leaders decided to make the young girl an outcast at birth and to not bless her. There was one Matriarch who did consider the girl’s discovery a blessing, though, and that was Teersa. She always showed love and affection towards the young girl and was even kind to Rost, who it’s technically illegal to speak to for members of the Nora Tribe. 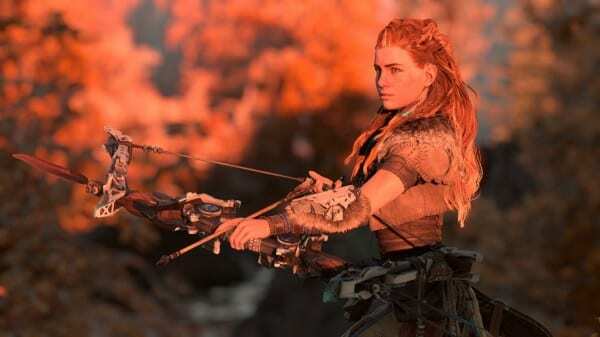 It is also her that allows Aloy to enter The Proving, a way to reenter the Nora tribe and return to its good graces. This is because Teersa believes that Aloy was sent for a reason, and that her destiny will be to help the people of the planet. As you grow up, you eventually find yourself in a small cave after running from some bullies. It is here that you have your first connection with the technological world outside of the robots you avoid. It is also here that Aloy discovers a Focus, the device she uses to scan her surroundings and learn about the world around her. It helps with her training, and gives her an advantage as she learns how to use the information the Focus displays to her. In time she grows into the woman you recognize from the trailers and heads for the Proving. 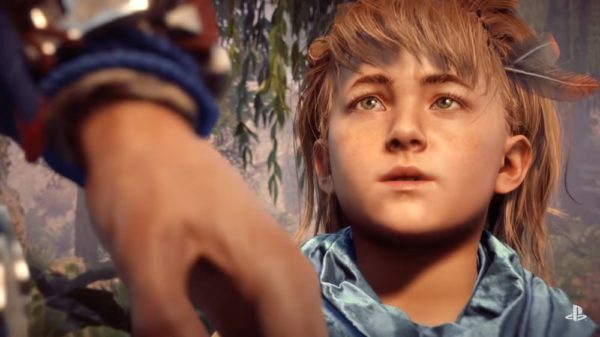 The Proving is Aloy’s chance to become a part of Nora tribe after being an outcast since birth. Even though she’s not really into it, Rost pushes her to do it, as nobody should grow up outside of their home forever. The Proving is a tough challenge that requires you to show that you can hunt and traverse the land with ease. 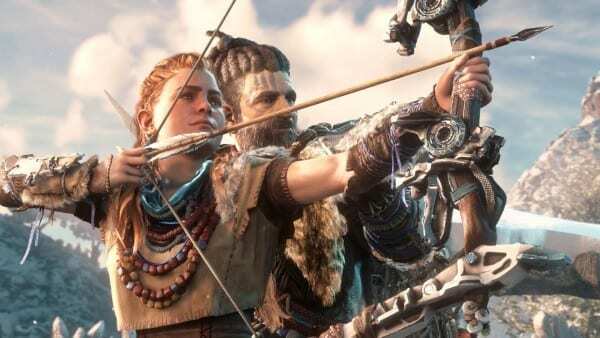 While everyone that completes the deadly challenge is automatically allowed to become a brave (a true member of the tribe), winning brings more prestige, something Aloy hopes to obtain in order to gain acceptance. After entering the Proving Grounds she is greeted by Teersa and introduced to several other key characters in Horizon Zero Dawn’s story. The two most important ones are Erend and Olin. Erend is an Oseram warrior while Olin is a scrounger who searches ancient ruins for artifacts. While watching the ceremony that kicks off The Proving, Aloy senses a signal which turns out to be a Focus that Olin is wearing. It’s clear that he’s special as this kind of technology isn’t common, and is frowned upon by the Nora, so he’s one to keep an eye out for. Aloy speaks to him, but he seems… off. It’s not clear why, but he seems to actively avoid you. After speaking to him, it’s time to get some rest and focus on winning The Proving. She does end up winning, but the joy of victory is not a long one as The Proving is also one of the major turning points in Horizon Zero Dawn’s story. Once Aloy wins, the village falls under attack. All of the other contestants, including the kids she used to watch from afar, are brutally murdered by a mysterious group of killers. Aloy holds her own very well during the battle as she realizes that they too have Focuses. She finds it odd that she’d never seen another one before, but in the last couple of days, she saw Olin and now all these murderers with the same device she has. She continues to fight and it seems as if she’s going to push back the enemy until she comes across a large brute of a man who snatches her by her neck and moves to kill her. When he starts to cut into her neck with his dagger, she’s saved by Rost who gives up his own life to save hers. 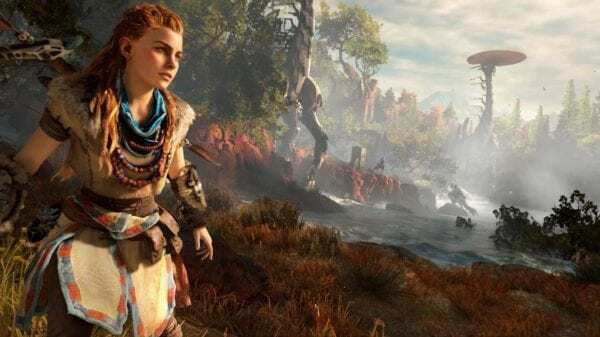 As Rost lies dying, the mysterious tribe places a bomb on the mountain where the battle just took place, and before it explodes, Rost crawls over and pushes Aloy off the cliff so she wouldn’t be killed by the blast. She falls unconscious only to awaken in a place she doesn’t recognize. 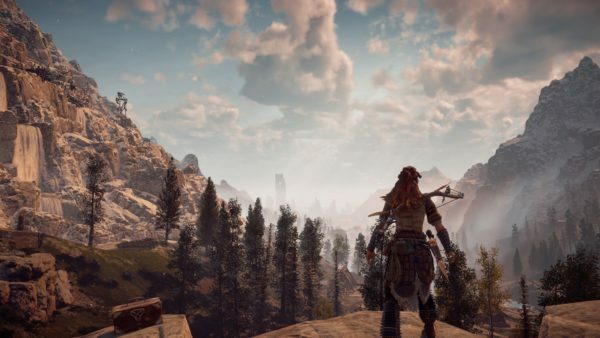 After the attack on the village and the death of Rost, Aloy finds herself inside of the mountain where the Nora village is located. She’s there with Teersa and the other Higher Matriarchs. After being told that so many people have died and that the killers are on the run, Aloy still has tons of questions. She remembers that the enemies had Focuses and that she managed to take one off of them. After examining it with her own Focus, she learns two things. The first is that they’re targeting a woman that looks almost exactly like her (could it be the mother nobody ever saw? ), and the second is that they were able to find her through Olin’s focus meaning he’s in cahoots with the bad guys. Before going to find Olin, though, Teersa has something to show Aloy, the place she was found. It turns out that she was found within the mountain in front of a large, steel door. It’s some type of bunker that nobody has been able to enter, and it’s believed that she came from within, which is why the other Higher Matriarchs hate her. The Nora are against anything that has to do with the robots and where they come from, and entering such a place is strictly forbidden so you can imagine what being born in one would mean to the tribe. Teersa believes that Aloy can open the door and when she tries she is scanned by a biometric scanner in the door. It determines that she is a 99.47% DNA match to the woman that looks like her. This also shows that the woman is connected to the door and would normally have access, unfortunately, there’s been a glitch. She will be granted access only if she can clear the corruption in the world. Aloy shares everything she knows so far with Teersa and the Matriarch makes the decision to give Aloy the blessing of Seeker. A Seeker is given the right to go absolutely anywhere, even forbidden lands, in order to serve a greater purpose. They know that the machines, which have been hostile, are part of the issue, and that the killers may have a part in it. Aloy is entrusted with the task of seeking out the truth and ending the corruption. The journey won’t be an easy one, and it will require Aloy to leave the safety of the mountain for the first time. Knowing that Olin is involved, she sets her sights for Meridian, the Carja city, to speak with Erend and hopefully get information on Olin. Meridian is as different from the Nora village as you can get. It’s a huge kingdom built of stone and metal, and the people within are adorned in fine silks and jewelry. It is ruled by Avad, the Sun King. Erend, the Oseram you met before The Proving, was an emissary from Meridian, helping to show that the Carja have changed and are working together with other tribes. After years of slavery and slaughter, Avad is working to make right all the wrongs that his father had done. He took over the city with the help of the Oseram and now several tribes live within the city walls. This is both a blessing and the cause for enmity that lead to your people being murdered, but we’ll get to that in a second. Upon arriving, Erend cannot believe your accusations against Olin, but allows you to search his home. It is then that you find proof that Olin is, in fact, working with the killers, who you still haven’t identified, but you also find out why. The large man that almost killed you is forcing Olin to do these things after taking his family captive. If Olin doesn’t do as they say, then they’ll be killed. Still, Olin’s actions led to the deaths of many people, and he must be brought to justice. After coming to terms with the truth concerning Olin’s involvement with what went down at The Proving, Erend tells you about some sites Olin likes to dig at that you should check out. Upon locating Erend, you see that he’s not alone. You witness one of the priests from the killer tribe reviving a Corruptor, one of the robots used to turn other robots into savage beasts. These people are controlling the robots, using them as weapons, though their reasoning is still a mystery. With all of those robots and the group of enemies, who each have a Focus, down there, there’s no way you can get to Olin until a stranger speaks to you through your own Focus. He disables the devices of your enemies so that you can kill everyone (including the Corruptors) and speak to Olin. Olin doesn’t even bother to beg for mercy because he knows what he’s done, but he does share what he knows with you. The group of killers is the Shadow Carja who also go by the name of the Eclipse, a new tribe that sprung up after the defeat of the mad king of Meridian. They worship the eclipse, which they see as the end of mankind, and they believe that it’s the machines that will help them take out not only the Carja, but everyone on Earth, leaving them as all that stands with their machine army. Their leader is Helis, the man who almost killed you and saw to the death of Rost. Of course, Olin is not okay with this, but his hands are tied in fear of his family’s safety. It turns out that he was rude at The Proving because he wanted to warn Aloy, but was being watched through his Focus which served as a type of leash. As you continue talking to Olin he will tell you of one more being, another “god” that is worshiped by the Eclipse. Its name is Hades, and while he’s never actually seen him, he has heard his voice. It spoke only once, and it was when Olin first laid eyes on Aloy. It has a terrifying voice, one of evil and steel, and Olin warns not to confront it. You learn one more thing from Olin, and it’s about the lady you saw in the Focus that looks like you. Her picture was seen in another place, Maker’s End, and if you want to find out more, you should head there. After dancing around it for some time, Horizon Zero Dawn finally starts to open up about the robots, and it has a lot to do with that mysterious woman that looks just like Aloy. On your way to Maker’s End, you get another call from the mysterious man that helped you back when Olin was surrounded. He tells you that the woman’s name is Elisabet Sobeck, though he won’t tell you anything else about her. He just confirms that what you’re looking for can be found at Maker’s End. The thing is, when you get there, it’s surrounded by more of the Shadow Carja. You have to fight your way through them and their mechanical buddies, but you should be used to that by now. When you get inside of the building located at Maker’s End, though, things get interesting. First, you discover that the Eclipse are working to excavate a Deathbringer, which is a large robot capable of… well, bringing lots of death. When you stop them, though, Aloy removes one of their Focuses yet again and examines it which is when she, for the first time, hears the voice of Hades. It says “Entity Lives,” then continues to repeat “Unacceptable” until the device explodes in Aloy’s Hand. The voice and the words used tell you that it’s not a human, but a machine or program. It’s still not entirely clear who or what Hades is, but at least it’s now known that it’s part of the machine threat and not a living thing (not in the usual sense at least). Yet that’s not the only thing you learn at Maker’s End. While exploring the building you discover two things, first is that Dr. Sobeck is thousands of days late for a meeting (meaning she hasn’t been around for a very long time) with Ted Faro. Mr. Faro is the head of a company called Faro Automated Solutions (FAS) and they are responsible for two things you see quite often while playing Horizon Zero Dawn: the Focus and the robots which are described by the company as “peacekeeping.” You even find out the true name of the Corruptor which is what the enemies use to turn robots, it’s called the ACA3 Scarab and was designed to override robots on a battlefield for those who wanted to use these peacekeepers for war. Unfortunately, the robots started to glitch in a very weird way. They gained the ability to consume biomass and use that to replicate. It’s why you see so many robots all around. It’s not clear why they were given the ability to consume biomass in this way. It’s possible that this was initially meant as a way to charge the bots, but the fact that they use it to replicate is something they should’ve thought about. What’s worse is that the glitch had them consuming biomass at such a high rate that it was calculated that Earth would be stripped bare in only 15 months, all because of the robots created by FAS. Sobeck knew that a countermeasure must be created in order to save humanity, so she got to work alongside the military. 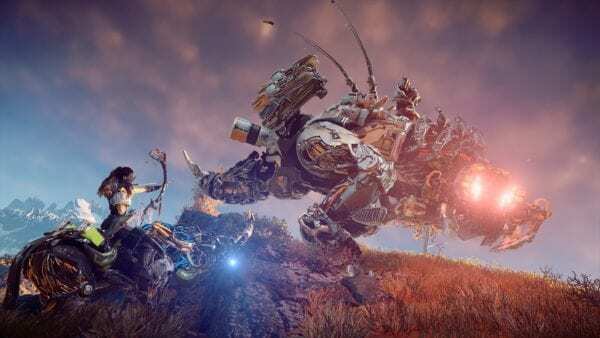 Zero Dawn was the fail-safe created by Elisabet Sobeck back in the year 2064 which is well before the events that take place in Horizon Zero Dawn. It was a means to disable the robots and return the world back to the humans that created them. It was how the current civilization of humans believe that humanity triumphed over the robots before and why they currently co-exist. Slowly but surely, humanity is rising again. Unfortunately, some of the people are using the robots as weapons once more, seemingly repeating the mistakes of the past. Around the time you learn about Zero Dawn, the mysterious man you’ve spoken to through your Focus reveals himself as Sylens. He informs you that he was once a member of another tribe but left to pursue knowledge about the world and the machines that inhabit it, and he also believes that Sobeck could still be alive either cryogenically frozen or using some other method. Fortunately, he says he will help you find her. The last known location that she was headed to was US Robot Command which is Grave-Hoard as the current humans know it. In order to find Elisabet, Aloy must head there to uncover how to utilize Zero Dawn once more. However, when she does discover what Zero Dawn is, it isn’t what anyone had anticipated. 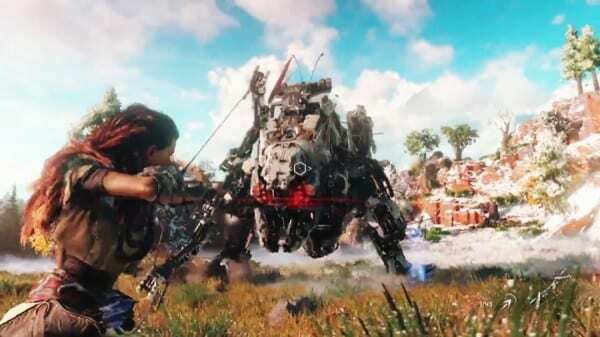 Many believed that Zero Dawn was a weapons system meant to obliterate the robots and save the human race. In order to buy time to develop the countermeasure and assuage the fears of civilians, everyone was given a weapon and recruited into Operation: Enduring Victory. They were to kill robots in order to slow down the flow, as they constantly replicated allowing Zero Dawn to be completed and the world to be saved. 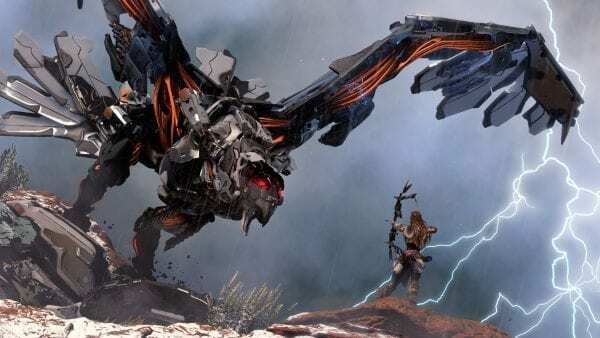 However, Zero Dawn wasn’t a weapons system at all. The glitch that took control of the robots was impossible to crack in a single lifetime. It would take 50 years to crack just one piece of the code and, as mentioned before, the human race had only around 15 months. So instead of stopping the robot threat, Zero Dawn would instead provide a way to bring humanity back into the fold through a terraforming system that also controlled the repopulation of the earth. This program was called GAIA which is one of the Greek deities. Also known as Mother Earth, it was from her that eventually the Titans would come into existence, followed by the Gods, and finally humanity, so it was a fitting name for this system that would create life. GAIA’s programs would first terraform the world that was consumed by the machines. It would start by building facilities from which it could spread its own machines required to help restore humanity. These are the underground vaults you come across, and the place where Aloy was first found. It also had different programs, also with names inspired by Greek Mythology, that would help achieve the goal. Some would clean the air, others the water, and there was those that were just there to build and manage. 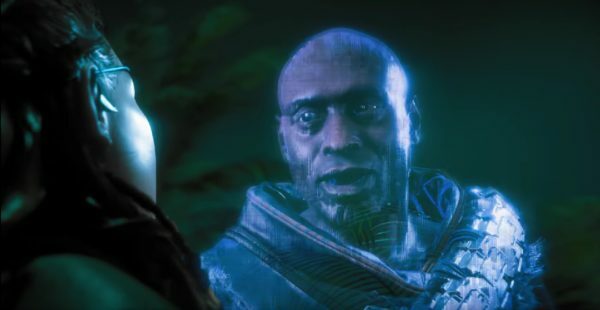 One of the facilities developed as part of Project Zero Dawn alongside GAIA was Apollo, the god of many things, but in this case, it was a reference to him being the god of knowledge. It would take all of the knowledge obtained up until that point and preserve it while also expanding it when the next generation of humanity learned more. That next generation, by the way, wouldn’t be born, as Zero Dawn was a preparation for extinction. Elisabet never beat the robots. All humans died. GAIA contained billions of seeds and embryos in order to create human life in machines, similar to what you saw in The Matrix. Those humans would then function as the humans we know today do, breeding and living off the land. They were to learn more and contribute to the cracking of the code behind the glitch before the next generation continued the process, eventually leading to the defeat of the robots hundreds of years in the future. The humans now are descendants of the previous humans, but not by birth. They were created in machines after humanity became extinct. While the humans alive around Aloy do breed normally, she was created by the machines, though the reason is withheld until she can find GAIA. Unfortunately, there were more issues to come. After learning the truth of Zero Dawn and about GAIA, Aloy must head to another location to find out more about GAIA. She learns about another program, one that was created as a fail-safe for GAIA in case anything went wrong. Its name was HADES. If GAIA was to create a situation that proved to be unsustainable, HADES would create a new purge, just like the one that killed off humanity the first time. It would trigger Hephaestus, the Greek god of many things revolving around fire, metal, and creating dangerous things, to create robots to consume the Earth again. It was a good thing, designed to help preserve humanity and give it a chance to survive well into the future. Unfortunately, things went wrong (which seems to be a common occurrence when humans and machines are involved). 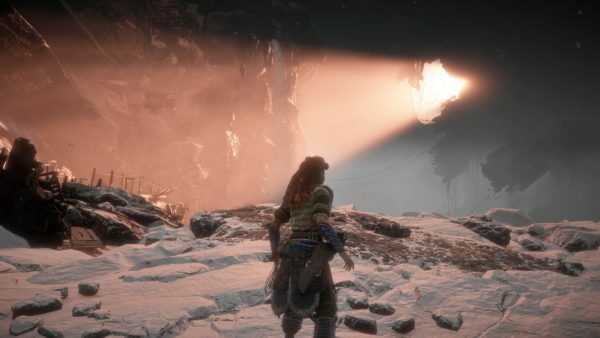 After Aloy finds a registry within the Zero Dawn bunker, she then heads back to the place where she was “born,” within the mountain where the Nora live. It is here that GAIA’s terminal is located. Within the location of GAIA’s terminal, some light is shed on why everything has been going to hell. While GAIA was working as intended, it received a transmission that caused it to lose control of the programs it was in charge of. You know, the ones that terraform the earth, help create babies, and keep everyone alive. This would lead to an unsustainable world, and so HADES was triggered and human life now has less than 60 days until extinction… again. GAIA, sensing something was wrong, created its own fail-safe – an explosion that would destroy both HADES and GAIA. It would save humanity, but it would also leave them on their own, as GAIA would no longer be able to regulate the planet. Another fail-safe, one that was triggered well before, was to create a re-instantiation of Elisabet Sobeck, which happens to be Aloy. She is essentially a clone of GAIA’s creator and was created to help the humans with the issues they faced. Unfortunately, although GAIA’s research showed that the humans would care for Aloy, they didn’t and made her an outcast due to superstition and a lack of knowledge. Now you may be wondering about Apollo, the system created to keep everyone up to speed. Unfortunately, that was destroyed by Ted Faro, the founder of FAS (the company that created the robots). Progressing further through the story, you find out that he killed a group known as the Alphas, humans chosen to usher in the new wave of humanity so that they could pass down their knowledge. He also purged Apollo’s systems of all information. It’s why the humans reverted to tribal life and have no knowledge or understanding of the world as it is. It’s why so little is known about the “old ones.” He felt that the knowledge would be a curse that would lead them all to doom yet again. It’s sad that the man who caused hell to visit humanity in the first place also decided that they didn’t have the right to know. Now that Aloy is up to speed with everything, Sylens prepares to share the rest of what he knows before going on his own journey. Sylens is not exactly who he seems to be, although it’s never clearly shared who he really is. What we do find out is that he was behind the awakening of HADES. He discovered HADES buried deep in the mountain, and the program promised him knowledge. So he helped to build the Eclipse, using the defeated Shadow Carja as a means to an end. Yes, they were bad guys already that hated everyone else, but there was no way they could utilize the machines themselves, they lacked the know-how. In essence, the big, bad, evil faction was just a large group of pawns used to help HADES get closer to its true target – the Spire of Meridian. So while the city was indeed a target for the Shadow Carja, who killed the Nora as a diversion, they were coaxed into being more aggressive by HADES. That Spire was actually created by GAIA and is meant to be used to send the signals needed to disable the robots after the code was cracked. HADES wants to use it to trigger a worldwide calamity, destroying everything in site and creating a machine planet. It’s never stated why HADES wanted to do this. After all, it was initially created to help humanity. Sylens shares that he’s been helping you to make amends for what the army he created has done all in pursuit of knowledge. He gives Aloy his lance, which has the ability to inject an override code into HADES, allowing GAIA’s fail-safe explosion to work. It’s now time to face the threat against humanity. HADES is nothing more than a computer, much like GAIA is. So the fight with HADES is actually a fight against its army of Deathbringers, Shadow Carja, and other machines. 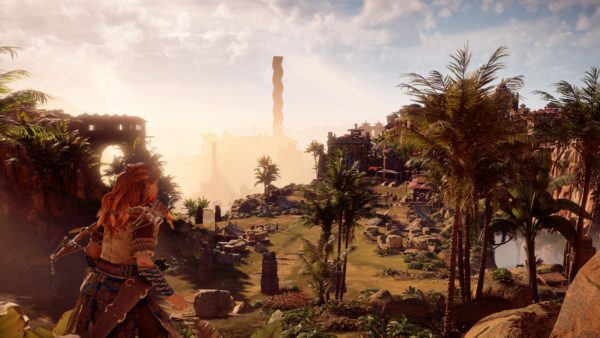 It’s a tough one, but one that Aloy must survive if she hopes to save humanity. Of course, in order to get to HADES, Aloy must fight her way to its new location, Meridian. The army is finally set to take the Spire, so time is of the essence. If Aloy doesn’t get the override code into this evil computer on time, then humanity is doomed. When she finally reaches it, the signal that triggers the end of the world is already being transmitted. 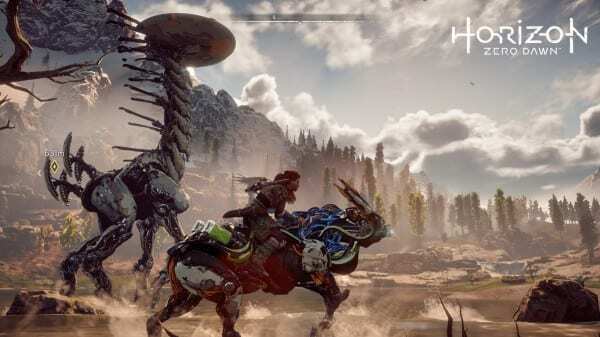 You can see powerful machines, larger than anything you’ve faced in Horizon Zero Dawn, rising from the ground all around Earth. They are ready to devour everything in their path. After a grueling battle with allies at her side, Aloy is able to defeat all the defenses and get up close to HADES. When she plunges her spear into the machine, she finds herself in a holographic world. It asks her to provide her name and rank so that she may complete her mission. She gives Sobeck’s name along with her information and it’s accepted. Aloy, the reincarnation of Elisabet Sobeck, and the ultimate fail-safe, defeats HADES and ends the machine threat. After defeating HADES, players are treated to a flashback of Sobeck talking to GAIA. It’s a story about how she accidentally set a tree ablaze and killed the birds living within it. Her mother made her look at that tree and the dead birds, forcing her to face her mistakes. It is possibly that moment that helped her face the doom of Ted Faro’s mistakes. In Horizon Zero Dawn’s timeline, Aloy continues to seek out the woman who she is a clone of, searching for her final resting place. When she does find her, she discovers that Elisabet had one wish, a daughter. She hoped that her daughter would be brave, compassionate, smart, and have the ability to save the world, even just a little bit, much like how Aloy ended up. In her hand is a globe of the Earth, showing everything she did, everything she sacrificed was for the world and those in it. That would’ve made for a beautifully simple ending, but Guerrilla Games couldn’t leave it there. 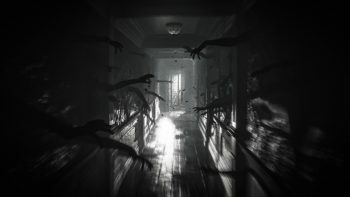 There’s one more cutscene, one that is a bit more sinister. Sometime in the future, a group of people stumbles across HADES, still with the spear inside of it. It comes back to life and fires off a flare of corruption through the sky in a seemingly random direction. It is caught by none other than Sylens who has found a large robot to revive. He stands there, with HADES within a smaller capsule in his hand ready to continue the work that was halted by Aloy. He was the cause this whole time, and the mystery behind him deepens as Horizon Zero Dawn draws to an end. 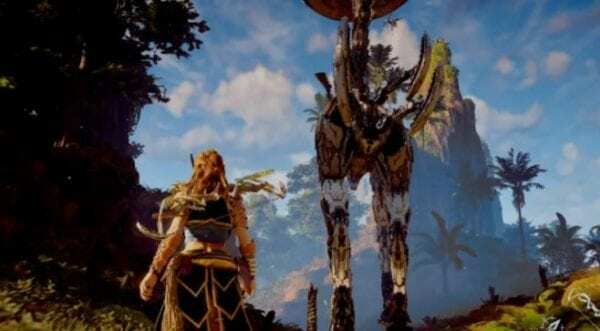 Horizon Zero Dawn’s story answered quite a bit of our inquiries from when we first saw the game at E3 2015, but it also left us with so many more questions when all was said and done. We have no idea who or what created the corruption that turned HADES evil, or where Sylens came from. Is he a human from this generation? A machine that looks like a human? Someone who survived the previous apocalypse, frozen only to awaken in the world as it is now? We do know that he doesn’t mean the world well which makes us wonder why he helped Aloy. The developers set everything up for a sequel or at least an expansion, but it was a wild ride getting to that point.